After Manchester City won against Cardiff, Liverpool once again needed to win to go top of the league. Southampton have pulled away from the relegation zone under new coach Ralph Hasenhuttl yet still haven’t guaranteed safety. Jugen Klopp went with his usual 4-3-3 formation, but switched out James Milner and Jordan Henderson from the team that beat Tottenham for Naby Keita and Fabinho. Hasenhuttl chose a 3-4-3 shape. Southampton took an early lead, exploiting some defensive mistakes. 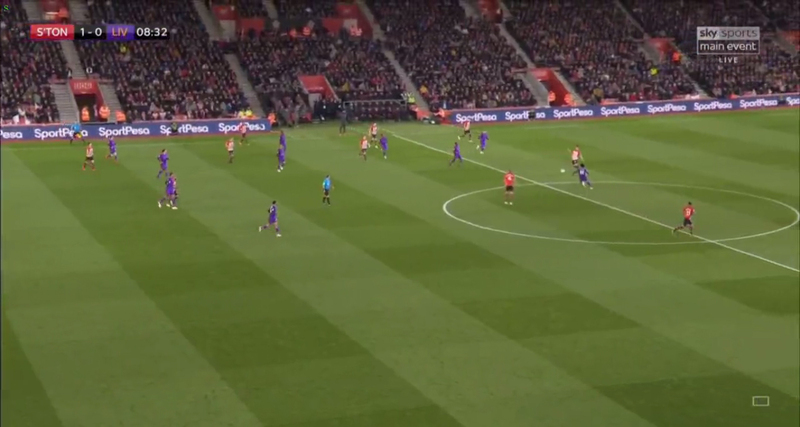 Liverpool were dragged out to the left to defend a throw-in, so Southampton switched the play to the opposite flank. Nathan Redmond’s intelligent positioning pulled Joel Matip across, opening up a large gap between him and Virgil van Dijk – the Cameroonian has played well since retaking his place in the starting eleven, but probably should have shown more awareness here, at least checking his shoulder more frequently if not moving back across, with Trent Alexander-Arnold and Fabinho in positions to deal with Redmond. Pierre-Emile Hojbjerg spots the gap and makes a run from midfield, untracked by Georginio Wijnaldum, to take advantage. Van Dijk is forced across to stop Hojbjerg, who is unable to bring the ball down but can flick on Ryan Bertrand’s cross. Andy Robertson moves to pick up Shane Long as soon as Van Dijk leaves him, however with his original man James Ward-Prowse making a run across he panics and tries to cut out the ball with a header. Robertson misses his interception, giving Long time to control and finish. Southampton managed a handful of attacks across the game, pouncing on Liverpool mistakes and sometimes able to trap the backline with pressing, but for the most part they sat defending, seeing just 33% of possession. Liverpool’s tendency is to attack down the flanks through the full-backs, but they seemed more willing to work the ball centrally here. 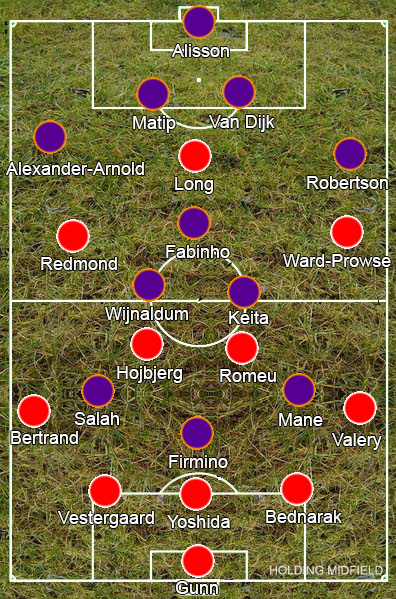 Southampton would drop back into a 5-4-1 shape with Long shadowing Fabinho, so Liverpool would have Keita, Wijnaldum and Roberto Firmino stand in the gaps between Southampton’s midfield four to receive the ball between the lines. This had mixed success. 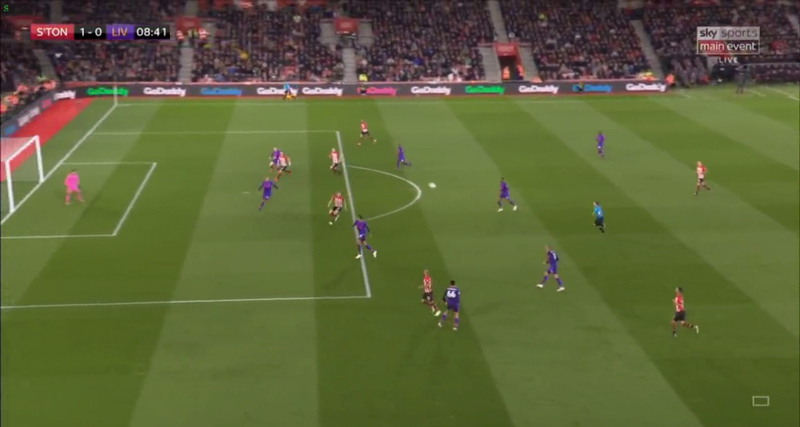 Liverpool were initially slow in moving the ball, resulting in lots of sideways passing along the backline, although this picked up after Southampton’s goal. 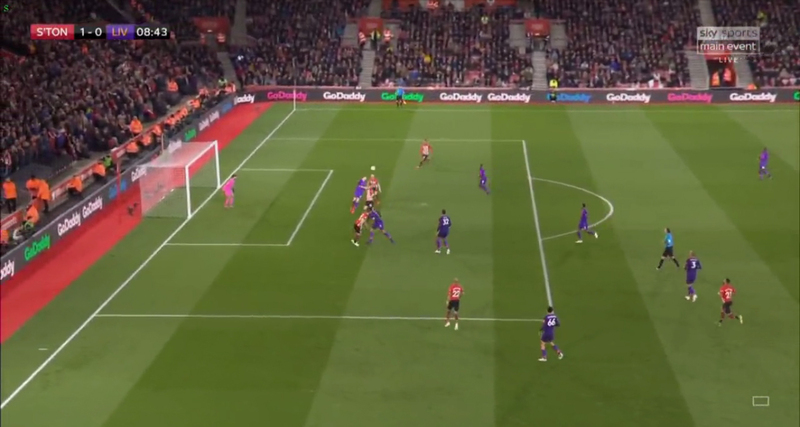 Southampton’s midfield narrowed to close the gaps between them, which gave Liverpool’s full-backs more space out wide, however the back five meant Southampton weren’t left stretched if Bertrand or Yan Valery moved out to deal with them. 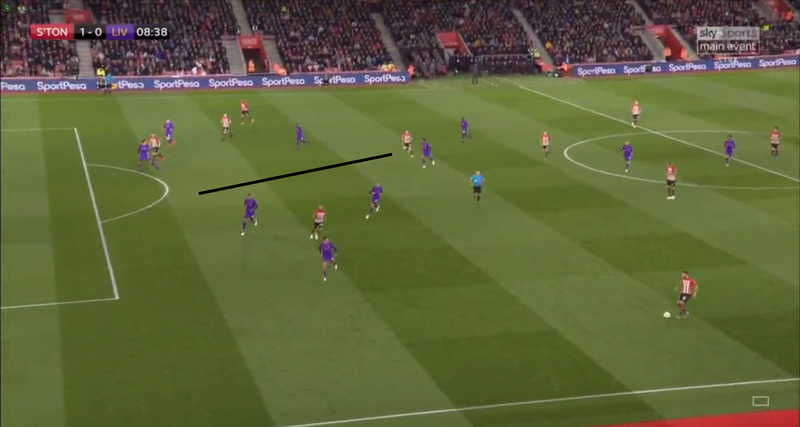 Even if Liverpool did manage to squeeze a ball through to one of these players between the lines, it was still difficult for that player to then turn and slide a ball through for Sadio Mane or Mohamed Salah in attack, with the back five leaving plenty of players available to defend. Wijnaldum or occasionally Firmino would drop back next to Fabinho, making it easier to work the ball out of defence as Long couldn’t shadow both of them, but with just two players between the lines Liverpool couldn’t stretch Southampton’s midfield effectively. Matip’s willingness to stride forward on the ball and force a midfielder out before laying off the ball to one of the attacking midfielders proved far more valuable than having a player drop back for Liverpool. Liverpool got their equaliser from a cross. They had sent in two immediately before, which had either been headed away or rolled back out, but for the third Alexander-Arnold gets plenty of time to pick out a cross and Keita, Mane and Firmino crowd the back post. Southampton’s defenders look confused as to who is meant to be dealing with who, only Jan Bednarek attacking the ball. He misses and Keita behind him is on hand to head past Angus Gunn. In the second half, Mane played up alongside Salah much less, mainly staying out wide on the left touchline or dropping off between the lines. This was a nightmare for Bednarak, who clearly wasn’t comfortable dealing with Mane’s pace or dribbling. Mane could drag Bednarak out of the backline then easily beat him, while there was more space in the middle for Liverpool’s other attackers to use. It was through a counter-attack that Liverpool got their lead though. Southampton came up for a corner, Liverpool won the ball, then passed up to Salah. 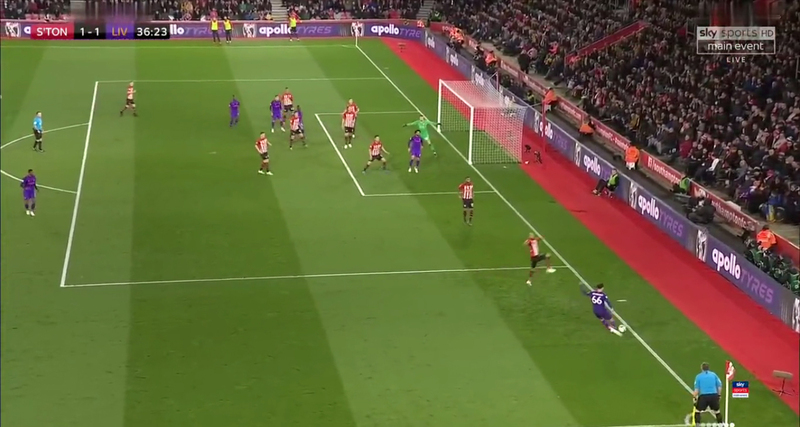 He kept running, while the run of Firmino meant Bertrand kept backing off rather than closing him down, and eventually the Egyptian got close enough to score. Minutes later substitute Henderson seals their win with a third. Southampton’s pressing scheme for a goal-kick leaves them three-against-three at the back, so Liverpool just hit the ball long over the top. Firmino gets to the ball and passes it back inside, with Henderson quicker to the ball, making a run from midfield to finish. One of the more promising things about this Liverpool team is how many points they are picking up without looking especially good. Previous title-challenging sides in 2008/09 or 2013/14 looked like they were hitting their peak, but this side honestly looked better at the tail end of last season. Without Alex Oxlade-Chamberlain, Liverpool have lacked creativity through the centre and yet they continue to pick up wins, having obvious room to grow yet already able to put together huge points totals due to quality in key areas, most obviously Alisson Becker and Van Dijk in defence and the attacking trio up front.